Took these yesterday evening. 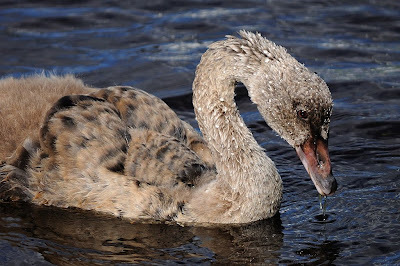 My little friend the cygnet is continuing to paddle about with his family and, while a little smaller and fluffier than the others, he is developing. 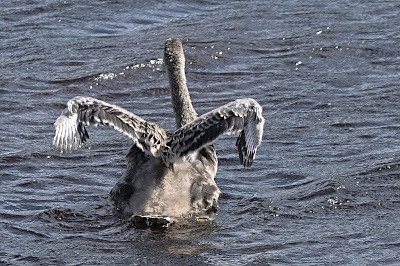 His wings are much smaller than those of some of the other five cygnets. 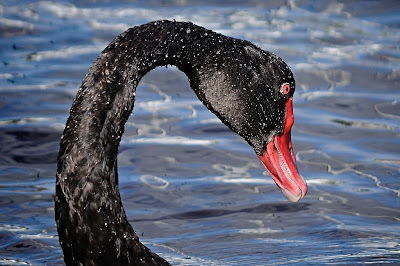 His siblings are larger, their wings are more developed and their plumage is darker. This is one of the largest ones out of the water and grooming. 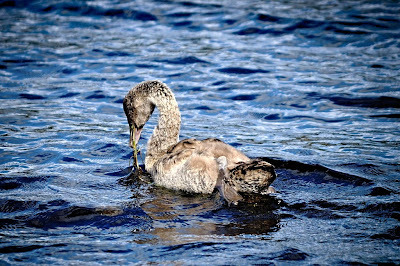 I haven't seen the injured cygnet out of the water. He did mess about above this same submerged log, but didn't stand and groom like the others were. I assume he can stand on the one leg, but I'm not sure how he would actually get out of the water. Possibly he doesn't, but floats about to sleep. 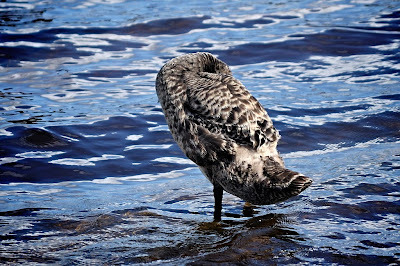 I have seen the whole family with heads tucked under wings floating around the wharf having a nanna-nap. Here one of his siblings is showing off their wings. The tide was quite high at the time, so the water depth over the bottom was much greater. I noticed that he was following the others around and swiping a bit of weed when they dived for it. He clearly cannot do the "duck-dive" that the others do, although I did get the impression he was trying to. Maybe with a bit more size and strength, and practice, he'll work it out. Here he is hanging around while the others dive for weed. And he's got some weed that one of the adults let him have. 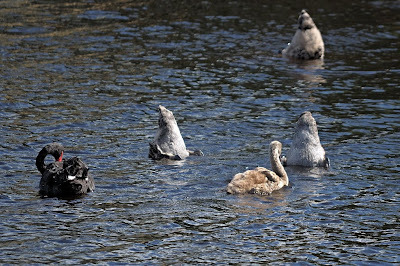 When I first saw the family in mid-December the adults were diving for weed and distributing it to the cygnets. They're still doing it for this one at times. If he pinches food from the others, it's not surprising that they peck at him. And here's one of the adults. Just liked the photo actually! Fantastic clarity on the head of the adult Swan. The "teeth" on the inside of the beak are very clear. 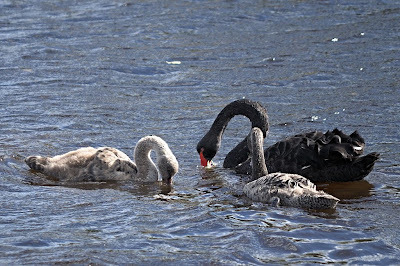 I've been keeping up with your postings about the swan family and the little one with the damaged leg. Very interesting observations. Sure hope the little fellow makes it! Hi Denis: I was pleased with the sharpness of a couple of the photos the other day. I think I'm getting better at photographing moving objects. Hi Mick: Yes it will be interesting to see if he does - just not sure how. Couldn't find the swan family tonight, but there is a lot of river they can use. Also, I've no idea if "he" is a "he" at all. He just struck me as like a lost little boy one time. Cheers! Just came back from Tassie and I wish I could have more time there to explore the wilderness and take more photos!